Just finishing up Alan Smale's 'Clash of Eagles', a narrative of bloody violence in a world where the Roman Empire is still a global superpower - and is expanding onto the North American continent. So far it's been pretty darn good - should have the review up tomorrow when I finish it. 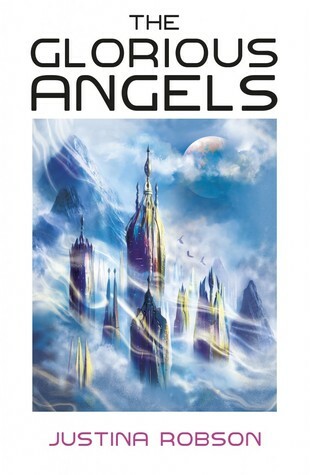 Glorious Angels is one of the most original works I’ve read in the last twelve months. It’s unabashedly clever, uncompromising, and full of scintillating ideas. It does have some flaws, but the core of the text is an enticingly intelligent read. The story is set in a world living in the shadow of its past. In the first few pages, the idea of a civilisation living in and around technology it neither understands nor really requires is presented, alongside a low level magic which is presented as both subtle and pervasive. The society shown seems almost to be in a gentle senescence, its dynamism sapped by a distant war which it appears, largely, not to need or understand. This aging techno-magic society is carefully portrayed; the entire environment is crafted around the blend of technology and magic, and it seeps through the narrative, a subtle underlay to all the character interactions. And it’s entirely believable, and beautifully done. Over the top of this underlying structure is a society where the traditional gender role of power is held by women – and much like the world, this is never presented to the reader with a sledgehammer, but carefully drawn out from the way characters thing and interact with each other. It’s a very convincing portrayal of how a society in this state might work, and the character dynamics and situations it presents are fascinating. The layer above both the society and the characters is the politics and the actions around them– the book begins with a melange of political plotting laced through the setting, though it certainly doesn’t stay there. That said, whilst there is a certain amount of action, murder and running about, especially in the latter part of the book, it’s not the focus; the majority of the plot comes out in dialogue, and in characters internal musings. This does have a bit of an impact on the pacing of the text; it definitely starts with a bit of a slow burn, as the reader is brought up to speed with the world, with the characters, with their motivations and drivers – the pebbles before the avalanche. The pace definitely picks up around the halfway mark, though. The only other issue is wrapped up in the characters and their roles; there are a few rather explicit love scenes near the start of the text; this isn’t really a problem (though it was a bit unexpected at the time), and fits the characters involved and their narratives – but be aware, if it’s something you’d be uncomfortable reading in rather excruciating detail! On balance, I think it adds to the text, but others may disagree. Overall then, this is a that rarity, a novel of ideas, which demands a great deal from its audience, and refuses to talk down to them – but rewards close reading, rewards perseverance, and has a lot of really interesting things to say, presented inside a narrative that is both interesting and compelling to read. Well worth taking the time to read. 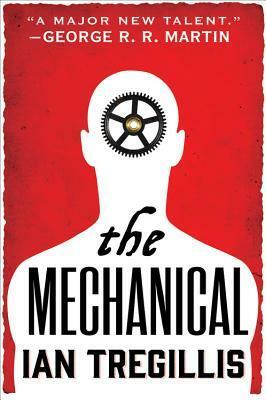 The Mechanical is a story about a great many things. About an alternate history, where man used Alchemy to create creatures in his own image. About a political struggle between two super-powers in that world. But it’s also a story about what constitutes free will, what makes someone ‘free’, and about what makes a person. This is a book with chases, melee and the odd murder – but also with moments of reflection, of anguish, of debate over how and why people do what they do. It’s a multi-layered literary confection – and each of those layers is perfectly constructed, and left me wanting more. The setting is an alternative early twentieth century. The point of divergence, the early 1600’s, when the Dutch scientist Huygens discovers, via a mysterious process, a means of creating autonomous mechanical men. These quickly turn the Dutch into a world power, which dominates Europe and drives the only opposition into exile in the Americas. Three hundred years later, The Mechanical begins – in a world where a Dutch empire is a fact of life, whose economy and military power is maintained by a vast army of mechanical servants. One of those ‘clakkers’ , ‘Jax’, is one of the three protagonists of the text. It is through his eyes that the reader is shown much of the Dutch Empire – at first as a beast of burden, and then as a fugitive. And the reader is also shown that the ‘clakkers’ regard themselves as individuals – that they are intelligent, that they think, and that they feel. What they mostly feel, it turns out, is pain – a series of restrictions placed on their behaviour by their makers, which cause pain in varying degrees if orders are not followed – as if Asimov’s three laws of Robotics were administered by a sadist. This makes Jax a very sympathetic protagonist, constrained by the demands of others, brutally punished when trying to avoid those demands – and also allows an examination of conditioning, and rebellion. The clakkers serve because they have no choice, compelled by internal torture if they try and refuse – but to each other, they are kind, civilised, apologetic, and, basically, humane. To avoid spoilers, Jax’s journey toward freedom is , to put it mildly, fraught, but he makes for a sympathetic and fascinating protagonist, whose struggles, physical and mental, make for excellent reading. The reader is given another perspective alongside Jax –that of ‘Talleyrand’, the spymaster of the only opposition to Dutch hegemony – the French monarchy-in-exile. The exploration of the French court is also fascinating – constrained by their own reverence for the past, the court is unwilling to take risks in an effort to ensure survival. Talleyrand, more prone to risk than their contemporaries, drives forward exploration of the Dutch clakkers, and looks for a means to free them from Dutch control, in an effort to break the Dutch power base. It’s indicative of the tone of the text that this is not done for the clakker’s benefit – Talleyrand wants to replace Dutch control with that of the French, swap one master for another. This strand of the narrative is perhaps the most energetic – a lot of the ‘action’ focuses around Talleyrand. There’s more than a few murders. Blood everywhere. Political intrigue. Point scoring. At one point, someone is skewered in a sensitive area with a sharp fire poker. Where Jax’s sections are a page turner as the reader follows his mental journey alongside the physical, Talleyrand’s feel more like the non-stop action parts of the text. Jax has a few of these, but Talleyrand holds centre stage for resilience and pragmatism, and revenge – if not for reflection. The last protagonist begins as an agent of Talleyrand, trying to bring key information and artefacts out to the French court. If Jax carries the mind of this text, and Talleyrand the heart, then this man is the soul – a secret Catholic in an empire where Protestantism is the only accepted religion, a man willing to risk everything to help fight what he sees as oppression of the clakkers. These sections read a bit like a John Le Carre novel – tradecraft, desperate escapes, murders in the dark. Tregillis sets out to explore what makes us human through these characters, to explore what defines free will. What constraints we put upon each other and others, and how we define ‘humanity’. The prose is characteristically tight and well constructed, and an absolute pleasure to read – though be warned, at times it is explicit, and at other times, absolutely skin-crawlingly horrifying. At the same time, the characters, as above, are very well drawn, and fit perfectly into the world Tregillis has created for them. It says something for the text that I simply couldn’t put it down. It’s dark, often horrifying, relentlessly brutal, and certainly not for everyone. But it’s also absolutely fascinating, and unapologetically clever, asking questions of both the characters and the reader which they may be hard-pressed to answer. As a text, it evokes terror and wonder in equal measure – and does so brilliantly. Well worth the read. I was a big fan of Jen William’s first book, “The Copper Promise”; it was a rollicking fantasy adventure, with magic, dragons, swords and sarcasm. It didn’t take itself too seriously, and yet still had a lot of emotional depth, and some genuine conflict that made for great reading. So my expectations for the sequel, The Iron Ghost, were understandably high. I’m happy to report that those expectations were met. The dynamic trio of Wydrin, Sebastian and Frith return for this instalment. From a plot perspective, they start off, as in the previous novel, doing what sounds like a straightforward piece of mercenary work for rather a lot of money. As ever, the job turns out to be less than straightforward, and rapidly spirals out of control – the pace picks up and the stakes rise with every page. There are a series of flashback chapters interspersed throughout the text, focused on Sebastian, largely dealing with the consequences of his actions at the close of The Copper Promise. Not to give much away, these explore Sebastian in the role of ‘father’, rather than as the tortured blade of the preceding text – and give his character a wider range of emotional depth and response than previously – expanding on an already well described character, and taking them out of the comfortable definition from the first book. The text also feels like it has a far stronger focus on Frith than the previous volume – or at least, it seems like he gets the most ‘screen time’. The arrogant Lord of the first volume is still present here, but over the course of the text he changes – deeply, if not dramatically. Again, not to provide spoilers, the character works well as a contrast to one of the villains of the piece, the reader presented with a living dialectic on the benefits and price of power – and how far people will go to achieve their goals. As one of the central pillars of the text, Frith’s relationships and character arc here is really well done, and a pleasure to read – even when it delves into some dark places and knotty problems. Wydrin, who felt to me like the epicentre of the original book, gets slightly less time here. She’s reliably entertaining. Smart, funny, inclined to run about and stick her nose into interesting situations. She’s the catalyst for the other two, and for the plot, quite a lot of the time. It feels like she develops less than the other two characters through the course of the text, but there are some interesting revelations, and the Copper Cat certainly doesn’t stand still throughout! I won’t spoil the plot, except to say that it takes places across whole new swathes of the world that Williams created – spaces quite unlike those she presented before, but drawn with a brevity and skill that gives them to the reader as visions, from claustrophobic cells to icy citadels and mountainous vistas. But the central core of the text carries a lot of emotional weight, and the characters always feel like they’re running against the clock, and playing for high stakes. 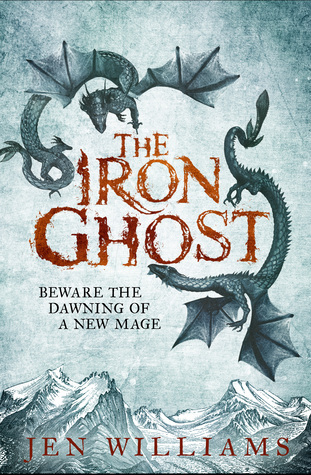 The original “Copper Promise” was a breath of fresh air, and The Iron Ghost takes all of the themes that made that first novel so interesting, and expands upon them excellently. Very much worth the read.